(Epic Illustrated#31-33) (Chapters 4-6) - Having traveled to Earth, Nova discovered that the planet had dramatically changed and the land masses had altered due to 100 million years of evolution, tectonics and other planetary changes. She discovered all that was left of the human race was a robot she nicknamed “Shakespeare”, who was unaware of what had befallen the people of Earth. Shakespeare showed Nova the last standing Earth city now totally devoid of life. Galactus arrived on Earth and felt great sorrow for the humans he once called friends but now free of the vow not to destroy it, he rescinded the ancient deal and began to feed on the planet and its energy. Nova asked Galactus to spare the ancient Earth city and he agreed by sending it into orbit along with the robot Shakespeare and placed it inside his gigantic world ship. (Epic Illustrated#34-36 ) (Chapters 7-9) - Having replenished his energies, Galactus and Nova started to investigate what was happening to the universe and traveled to the very heart of the galaxy only to discover that the stars and planets had formed a tapestry around a tunnel in space. Galactus left his ship and launched himself toward the very center and into the darkness beyond. After a day's journey, Galactus found that the very planets had been moved systematically by some unknown hand and that all the planets within this artificial tunnel all bore life. Curious for answers, Galactus set down on a planetary sphere and coming across its inhabitants, he conversed with their wise man, the All-Father, who related to him that his planet was moved in order to protect them from the all-consuming hunger of Galactus. The one responsible dwelled at an unknown planet somewhere at the heart of the web of planets that formed the tunnel of stars. Using his vast mental telepathy, he sent Nova to seek out the source of power used to move the galaxies into their new positions. Nova discovered an enormous machine equipped with a gigantic phased plasma rocket and at its center was a black hole large enough to swallow galaxies whole. However, she was attacked from behind and summoned Galactus. 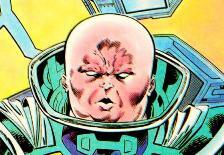 Responding to Nova, Galactus arrived at her destination and came face to face with the one responsible for the disappearing galaxies: Ecce the Watcher. (Epic Illustrated#37) - Galactus battled Ecce the Watcher who had witnessed his "birth". Both of them battled for over a thousand years and the universe began dying around them. All the stars burned out and as opposed to there being a "big crunch", entropy won over all. The universe started to flicker out of existence, and Galactus drew his last shreds of energy, giving him just enough of an edge to defeat the rogue Watcher. Galactus and Nova, his herald, were left in an empty void. Galactus came to the realization about what he had been doing for billions of years. He cracked his armor and all the energy he had absorbed spewed out of him. Galactus then became the Big Bang of the next universe. Nova survived and became the "Galactus" of the next universe. And so the cycle continues. Comments: Created by John Byrne (writer & pencils) and Terry Austin (inks). This story takes place in an alternate timeline since Nova appears to have been his herald for 100 million years. She is after all dead by the hands of Morg in Silver Surfer III#75 and still remains that way. Galactus has also created other heralds to take her place since then. This story was never completed by John Byrne and the last Chapter information is based on his synopsis of events that would have taken place, devoting one page of text to explain what the outcome of the story would be. John Byrne was approached at one time to write for Marvel's "The End" project, and was asked to consider "last issues" for the X-Men and the Fantastic Four. One of the things he wanted to do was finish the Last Galactus Story featuring the Fantastic Four. But alas this project never came to pass. For an alternate ending to this story visit the John Byrne website. Ecce is an appropriate name for a Watcher - it's the Latin word for "look". In this future timeline, Galactus kept Nova as his loyal herald and his hunger remained. 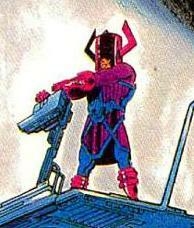 Galactus was concerned at the changes in planets and galaxies and investigated these cosmic events with Nova. With the incredible changes wrought on the Earth over millions of years, he no longer felt bound to not eat the planet and consumed its energies. Galactus then set out to investigate the awesome changes made to the universe and came across the All-Father who told the world-eater of what had transpired. Alerted by Nova, he encountered Ecce the Watcher and the two battled for a thousand years until Galactus eventually prevailed. However, he realized what he had done during his time as Galactus. 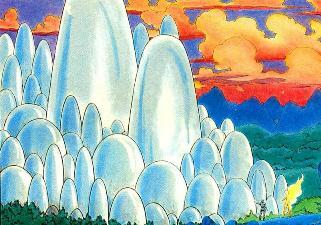 He released the energy stored inside him, exploding to become the Big Bang of the next universe. In this future timeline, Nova (Frankie Raye) stayed as Galactus' loyal herald. Energized by the Power Cosmic, she had not visibly aged. She saw evidence of interference and reported it to Galactus. She was dispatched to Earth and encountered the robot Shakespeare. Later, she discovered a massive machine that led to Galactus confronting Ecce. 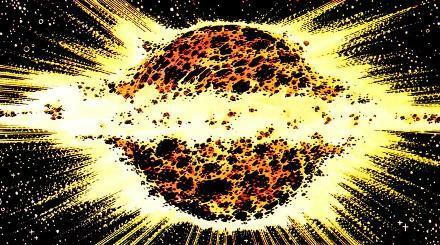 Nova survived the Big Bang generated by Galactus and became the latest version of the planet eater. The last remaining inhabitant on the planet Earth was designated Lit-Rob 839. He was befriended by Nova and avoided the destruction alongside the last intact city on the Earth and stayed on board Galactus’ world ship as Nova and Galactus investigated the center of the galaxy and the tunnel of stars, along with planets found there. Lit-Rob 839 was a Literary robot programmed with the knowledge of Shakespeare’s collected works and spoke in rhyme. It was not revealed what may have become of him when the new Big Bang recreated the universe. The All-Father was a wise extraterrestrial man who inhabited one of the millions of planets making up the tunnel of worlds at the center of the galaxy. His people once lived on a technologically advanced society but when Ecce the Watcher abducted his planet a millennium ago, they appeared to have regressed into tribal clans with little in the way of high-tech devices. The All-Father, although hesitant, provided Galactus with information about where to find the one responsible and why they were placed in this environment like they were. He was stunned that the mighty devourer , Galactus, had no idea what was going on and could not believe he needed to ask, him of all people, to provide the answers he was seeking. His world and countless others ceased to exist when Galactus absorbed the remaining energy of the universe to defeat Ecce. The All-Father was probably more of a title than an actual name. After witnessing the birth of Galactus, as a rule of non-interference of cultures and events in the universe, he had the opportunity to kill him but decided against it. Spending billions of years regretting that decision, he went mad and began transporting the galaxies and inhabitants into a web-like tapestry orbiting the center of the universe in the hope of protecting other worlds from Galactus’ great hunger. 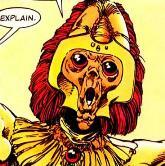 However, he was discovered by Galactus and they battled each other for a thousand years but Ecce was defeated. Although his intentions were good, he was unable to protect what he sought to hide. The universe died but was instantly reborn as Galactus recreated the Big Bang.